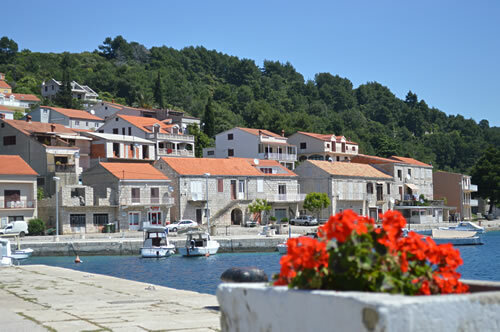 Last September, on our way from Hvar to Dubrovnik we called in briefly at Korčula. Now, I don’t think it really counts as visiting the island if you stay on the ferry, and don’t actually set foot on land. But we liked what we saw, so a couple of weeks ago, we set out to do just that – explore the lovely island of Korčula from end to end! The logistics of island-hopping in the Adriatic can be somewhat challenging, especially out of season. Jadrolinija seems to think that islanders should move northwards in the early morning, and southwards in the afternoon. It’s a kind of diurnal migration pattern that defines the movements of the islanders, and for folks on Hvar it means a day trip to Brač or Split (northwards) is possible, while going to Korčula (southwards) requires an overnight stop. And so we planned to stay a couple of nights, one at each end of the island for maximum coverage! Arriving into Vela Luka on the late afternoon catamaran from Hvar, we were struck by how large the harbour is. 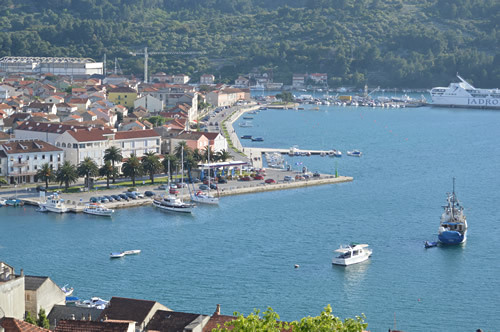 Of course, that is precisely its name – as Vela Luka translates as Big Harbour or possibly Great Harbour! The marina curves round in a backwards “J” shape, giving a very safe protected area for boats of all sizes. There’s industry here in the shape of a working shipyard, fishing boats, and there’s also a hospital & health spa. We notice that most cars have DU plates, not ST as on Hvar. It would appear that Korčula belongs to Dubrovnik county, while Hvar is part of Split county. I wonder what difference that makes to life on the two islands? Will be interesting to find out. Vela Luka has some older stone houses, along with some fairly large commercial waterfront properties dating from the 19th century, clearly a time of prosperity and expansion here. And many newer houses spreading round the harbour – looks lovely! Our room here is at B&B Vela Luka – conveniently placed in a quiet street just off the waterfront. The owner runs the cafe downstairs, with a the most amazing choice of home-made ice creams – the extra-dark chocolate was sublime! 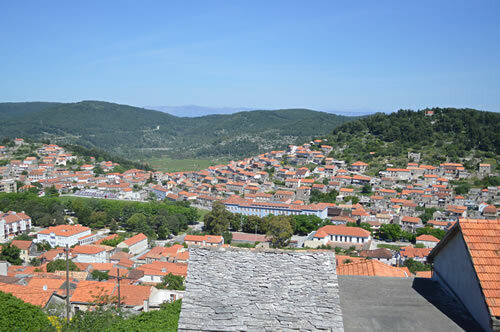 The area around Vela Luka has been inhabited for a very long time. For about 20,000 years, in fact! There’s a cave in the hillside overlooking the harbour, where artifacts have been found dating well back into the stone age. 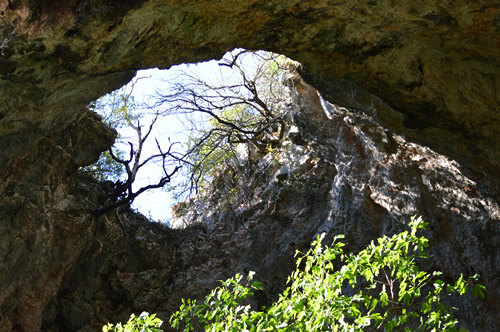 Vela Spila (meaning the Great Cave) was a refuge for people during the ice age, when sea-levels were about 120 metres (or 400 ft) lower than today and these were not islands, but part of the mainland, and the coastline was out somewhere near Vis! It’s a strange thought, imagining what this was like with no seashore, but herds of red deer and ancient horses roaming around – pursued by a bunch of hunter-gatherers who lived in the cave up there. We followed the path up the hill for some gorgeous views over today’s Vela Luka, and spent some time in the cave, trying to work out how it looked the past. Of course, by now the roof has partially fallen in, and the neolithic floor is some 7 metres below our feet. The present surface is somewhat slippery, due to water continually dripping from the ceiling and we have to tread carefully. We have the place to ourselves in the early evening sunshine – just us and a family of house martins nesting by the front entrance! For dinner, we consulted the ever-helpful Niki in the tourist office, who suggested Restoran Bata. 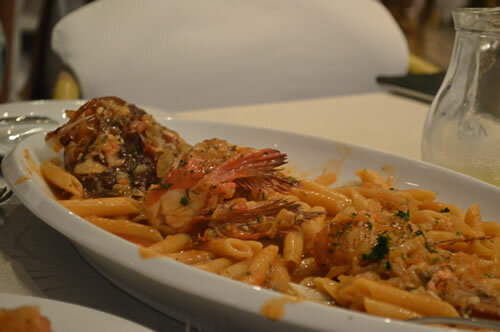 An excellent choice, and we enjoyed the view from their balcony as we ate our Veloluška Popara – fish served in local style with a white wine and tomato sauce on a bed of pasta. 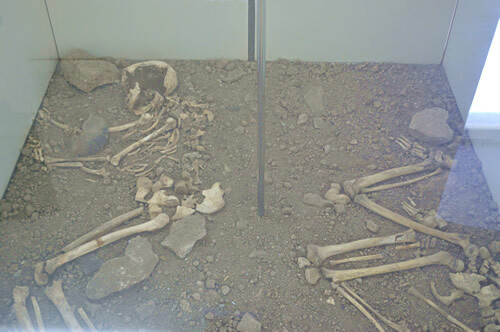 The next morning, we visit the Cultural Centre in town, a lovely local museum where they have a selection of artifacts, and indeed, two complete skeletons from the cave on display. Sorry about the quality of the photo, couldn’t avoid catching the light reflection on the glass. 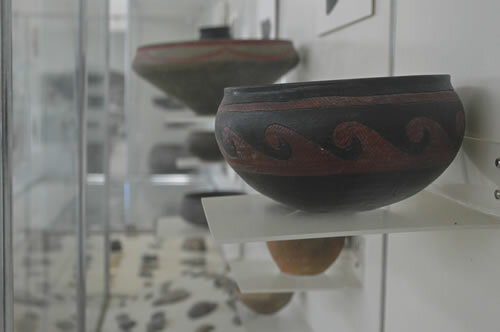 There are small fragments of very early ceramics, some in the form of animals which predate any other known use of ceramics in this part of Europe. Very impressive, all totally fascinating! Will need to read about this in more detail and write a proper blog article. Also at the museum, they have a display of rather more modern mosaics, which I was greatly taken with. These are from a series of International Encounters of Artists, held here during the late 1960s, early 70s. 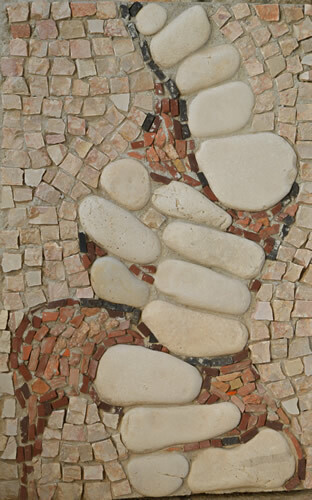 Artists from all over the world came here and created these beautiful mosaics that now grace the courtyard of the museum, and along the waterfront. It’s wonderful to see a thriving art gallery and museum on the island, holding events and classes – a real cultural centre for local people, not just for visitors. Having arrived on the island by catamaran, we were, of course, carless. So we had arranged transportation through the wonderful team at Korčula Explorer, who responded with enthusiasm to my challenge to include art, history and wine on our tour. Our driver Nikola, took us on winding scenic roads through towns and villages, across wooded hills and round pretty coves, chatting knowledgeably on all kinds of local topics! Blato must be the biggest town on Korčula that I’d never heard of. With a population of 7,000, larger than any town on Hvar, it appears to be a market town with real businesses and commerce, as opposed to simply tourism. The main street is lined on both sides by lime trees – 100 of them, providing lovely shade, but not a lot of width for modern two-way traffic! Slows everyone down which isn’t such a bad idea, really. 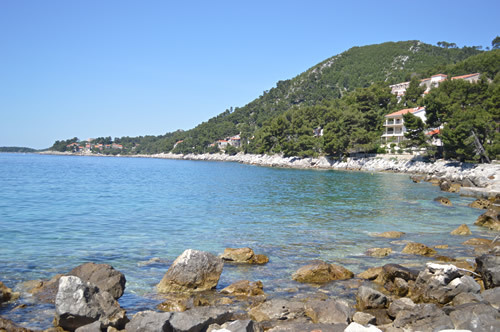 After Blato, we head down to the southern shore at Gršćica (rather a tongue-twister, that one!) and made our way along the coast to Brna. There’s a series of small islets offshore, offering protection from the worst of the Jugo storms. As a result, lots of apartments and holiday homes hug the coastline below the level of the road. Very pretty! Brna – pretty as a postcard! 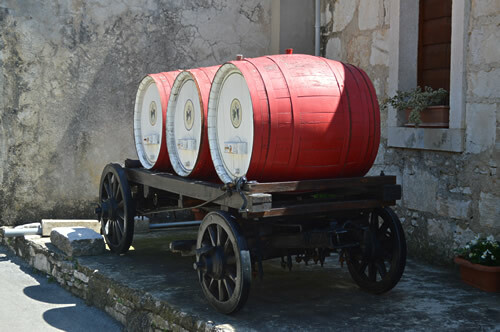 Turning back inland, we enter Korčula’s wine country around Smokvica. A wide valley surrounded by wooded hills, this is where pošip is grown, one of the two white grape varietals that this island is famous for. Toreta winery – can’t miss it! We’re calling in at Toreta winery, where we get a chance to taste the wines and learn something about the culture here. 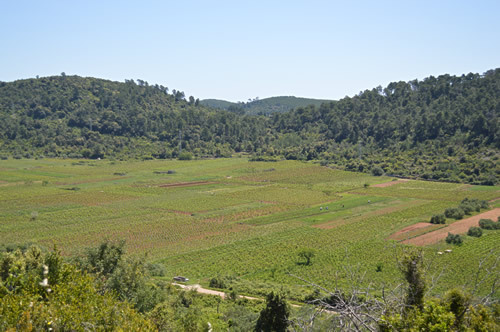 The vines are only grown on the valley floor, not on hillside terraces though you can see some remnants of older terracing there, dating to the pre-phylloxera boom. 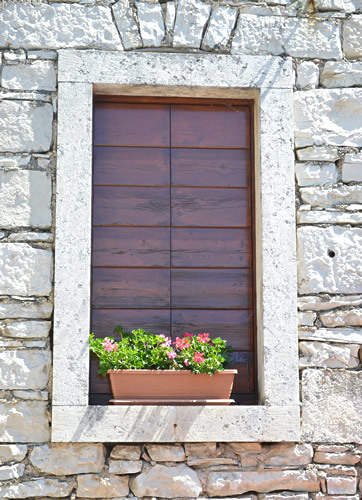 Toreta is the local name for the round drystone field shelter that would be called trim on Hvar, and bunja in Istria. 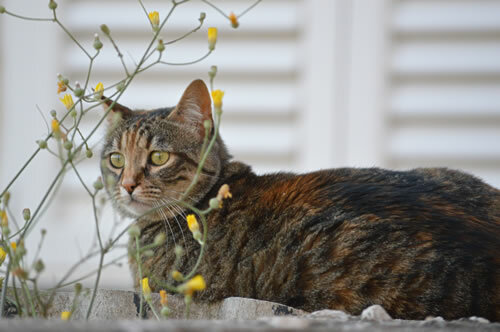 They’re not so common on Korčula, in fact there are only five known, and all of those are on Toreta land! 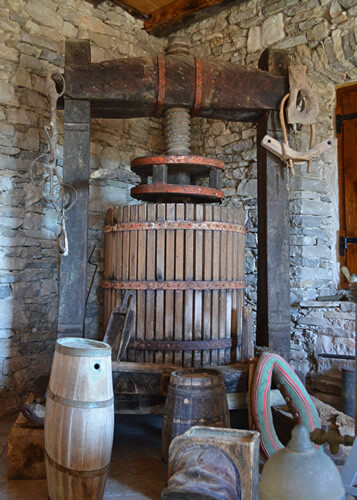 The winery has a lovely tasting room with great views over the vineyards, and a collection of antique wine-making equipment. Winemaker Frano Baničević guided us through the tasting. Toreta makes two versions of their pošip, one light and fresh, and the other more complex, with a subtle oak aging. They also make an excellent prošek (dessert wine) from pošip and have a range of flavoured rakijas, of which I really liked the tangerine. They also make an excellent artisan olive oil. We’re excited to find out that their wines will soon be available in the US from Blue Danube. 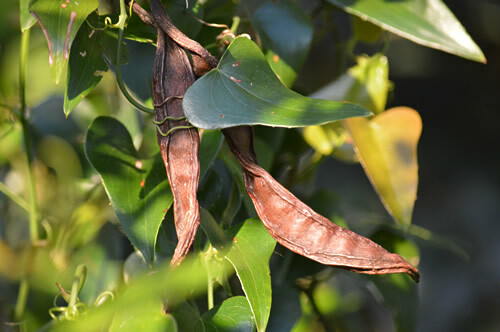 We also learned an interesting snippet about carob seeds – which were the original standard for weighing gold. It was believed that carob seeds didn’t vary in size very much, and although that myth has now been debunked, we still use the name carat via Arab, Greek and Italian as our weight system today. I shall look at carob with different eyes from now on! Moving on from Smokvica, we pass through Čara which used to be one of the best-known pošip wine-cooperatives, but sadly struggling now. We take a short detour down to Zavalatica on the coast but find no sign of anyone at Krajančić winery, – we’ll need to come back sometime. And it’s off on the new fast road to Korčula town and the eastern end of the island. To be continued… read part 2! 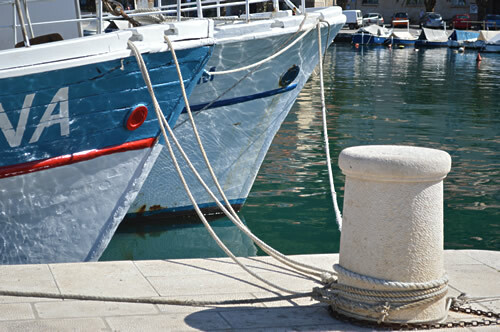 Links and references to find out more or arrange your own trip to Korčula! Vela Luka Cultural Centre and Museum – no website, but we would like to thank the lovely staff there for showing us around on a Saturday morning. Much appreciated!